Hold fast to dreams, for if dreams go, life is a barren field frozen with snow. Langston Hughes' words are forever etched into my brain, thanks to my grandmother's insistence that my sister and I memorize "Dreams." At 6 years old, I had more dreams than my little arms could hold! I penned and illustrated my first book as soon as I could hold a crayon. I crafted cute advertising slogans and artwork on our computer, preparing for my glamorous career as the head of my own ad agency, Creative Minds At Work. I drew sketches of fashion-forward gals in my school notebooks. I even dreamed of being "discovered" on the street to become a famous actress in Hollywood. My dreams had just enough air to flit around the sky, but not enough to soar. Over time, I loosened my grasp so I could lift up more practical goals. My new ink will see to that! I went to All Star Tattoo and had a fantastic experience with my artist, Ed. He was friendly, utilized my ideas, and set me at ease, even though I couldn't watch the actual inking. I would definitely go back! What about you - do you have any dreams you've been too scared to pursue? What keeps you going? Please share! 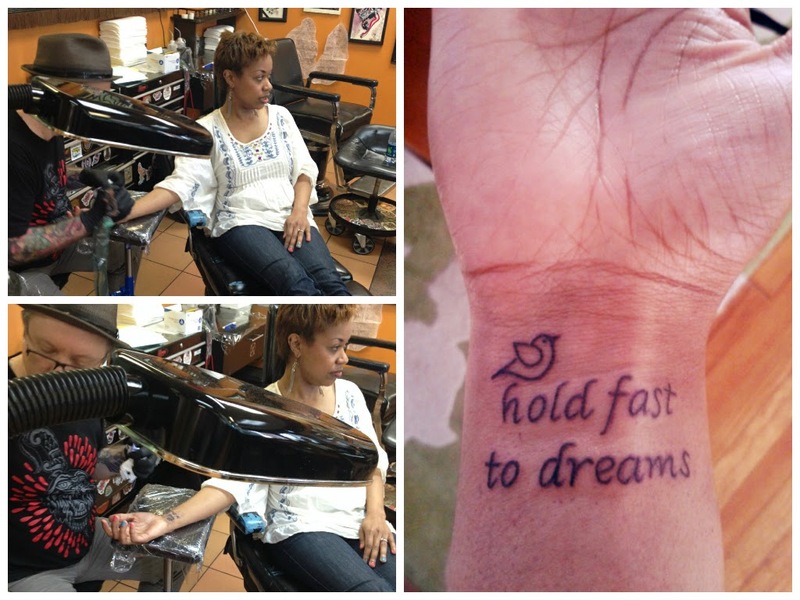 Beautiful thoughts and a beautiful tat!